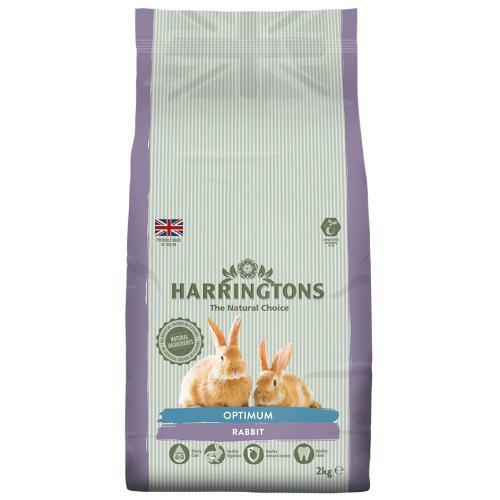 Harringtons Optimum Rabbit Food is a premium, fully extruded diet for your smaller pets. It has balanced nutrition to avoid selective feeding and is fortified with natural antioxidants and vitamins to help support your rabbit's immune system. Added fibre and yeasts help improve digestion. Ingredients: Wheatfeed, Oatfeed, Lucerne, Sunflower Ext., Maize, Grass, Apple (4%), Grape (4%), Carob Meal, Vegetable Oil, Linseed, Minerals, Yeast (0.1%). Nutritional Analysis:Protein 13.5%, Fat Content 4.5%, Crude Fibre 17%, Crude Ash 7%, Calcium 0.7%, Phosphorous 0.5%. Nutritional Additives: Nutritional Additives: Vitamin A 17,000 iu, Vitamin D3 1,700 iu, Vitamin E (alpha tocopherol acetate) 95 mg, Iron Sulphate Monohydrate 33mg, Calcium Iodate Anhydrous 2.5 mg, Cupric Sulphate Pentahydrate 25 mg, Manganous Oxide 48 mg, Zinc Oxide 34 mg, Zinc Chelate 167 mg. Antioxidant.